Yugoslavian M53 8mm belt drum. Holds one 50rd belt of ammo and starter tab. 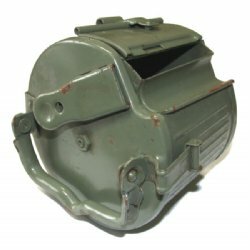 This drum mounts onto M53 or wartime MG42 and MG34 8mm Feed Trays. Looks just like WWII German production. Condition is surplus VG. Product Review: Rated 5 because it was exactly as described. Not perfect but looks good, I'm going to use it as is. Very little rust, no damage or missing parts. Paint looks good.